This webpage consists of a video showing the progression of a bearded dragon drawing. It's a speed drawing, so you don't have to sit and watch for 2 1/2 hours to see some dragon art. 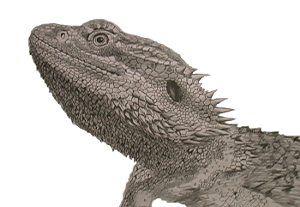 Watch the video below depicting a realistic drawing of a bearded Dragon. This isn't really an instructional video on how to draw a pet lizard, although you might pick up on some techniques that I use and possibly implement them with your own goals in drawing. Bearded dragons aren't usually the subject of a drawing. Most lizards have an intricate pattern of scales that go on and on in ever changing patterns. This proves to be rather tedious, as the challenge of drawing every scale can be a bit time consuming. What might be unique is seeing a bearded Dragon done in the abstract art form. As long as it's spikes were represented someone might be able to tell what it is. Something that is a popular realistic drawing subject would have to be the fictitious dragon drawing. This giant creature, although never having existed, definitely captures the imagination of thousands of people. Maybe it's because they're made out to be enormous and have the ability to fly. Let's not forget their talent of breathing fire as well. That type of dragon art takes an enormous amount of imagination and skill, as there are obviously no subjects from which to draw. The realistic drawing above could probably have been done with the actual lizard posing for his portrait -instead of drawn from a photograph. I say this because anyone who has ever owned a bearded Dragon knows they have a talent for staying still for ridiculously long periods of time. What would be interesting is combining a bearded Dragon drawing with that of a mythical dragon art drawing. I suppose I would choose to draw the head of a bearded Dragon fused with the body of an ancient flying -and firebreathing mythical dragon. Be sure to watch the realistic drawing above of a bearded Dragon. Also, check out the Lizard store for fun bearded dragon products!